This weekend I went to Detroit to see my dear friend/former college roommate/sorority sister get married. I drove to Michigan with my friend Annie, who came up from the DC area. We had a grand road trip and made it to D-Town with plenty of time to eat lunch and get ready to go to the ceremony. The ceremony was held in a small chapel right near the water and it was beautiful. The reception was held at the hotel, so many of us had a drink at the hotel bar before going up for cocktail hour, dinner, and dancing. I think the thing I liked best about Michelle and Phil's wedding (besides, of course, seeing two people I love become husband and wife) was that I got to see a lot of people from college I hadn't seen in a long time. I was fortunate enough to see some of my best friends/former roommates/sorority sisters that I see with some frequency. I also saw a few sorority sisters and other college friends I hadn't seen since graduation. FIVE. YEARS. AGO. Damn. It was really fun. They had a great band playing and the food was delicious. This is a shot of Michelle with all of the Kappa Delta sisters that were able to attend. So many!! It was really a special moment. 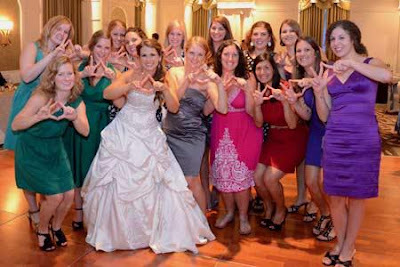 We sang to the lovely bride, as is tradition, and then we did a KD cheer before taking this picture. Please notice how semi organized by color we are. Amazing, I know. We are too awesome. Overall, it was a really splendid weekend. I'm so glad I was able to go, so glad I was there to witness Michelle's special day and spend the evening dancing with my friends. I was super sore on Sunday (and, let's not lie, yesterday) from the seriously serious dancing that occurred, but it was worth it.